Les Noces (English: The Wedding) is a ballet in four scenes, originally for the Ballets Russes of Sergei Diaghilev. The ballet was choreographed by Bronislava Nijinska and the music and words were written by Igor Stravinsky. The music is written for voices, four pianos, and percussion. The ballet was first presented on 13 June 1923 at the Théâtre Gaîte-Lyrîqué in Paris. The ballet is sometimes called a "dance cantata", and the music is sometimes performed as a concert piece. In 1915 ballet producer Sergei Diaghilev wanted to create a ballet called La Liturgie. Its background would be the Greek Orthodox Church. 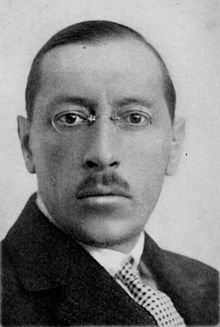 Stravinsky was a strong Christian, and did not want to write this ballet. He turned instead to Russian folk songs for Les Noces. He had started to think about this in 1913. Michel Fokine started the choreography but Vaslav Nijinsky took over. Leonide Massine stepped in for Nijinsky. When Massine left, Bronislava Nijinska designed the dancing. Design for the ballet (sets and clothing) was done by Natalia Goncharova. Goncharova, an outstanding artist, made two complete designs before her third was accepted. The first two designs were rejected because they did not suit either the dancing or the musical score. The ballet, though based on a folk tale, was modernist in style: Stravinsky and Nijinska thought it was important for its design to be in sympathy with this. The bride, Nastasia, is having her hair done. She complains that it hurts when pulled. The choir sing to her about how beautiful her life will be with her husband, Fétis. The nightingales will sing to them in the garden. The choir sings to the Virgin Mary. They sing about the husband-to-be and his fair hair. They ask for a blessing for the young couple. The actual marriage ceremony is not seen. In the last of the four scenes, we see the wedding feast. The people are happy and start to get drunk. The husband and wife are led to the bedroom. The ballet is still in the repertoires of some major ballet companies, such as the Royal Ballet. It was performed in 1936 by Colonel de Basil's Ballets Russes, one of the successor companies to that of Diaghilev. Its post-WWII revival in London (1966) was personally supervised by Nijinska. Because of this, the ballet is still danced to its original choreography. It was also performed at Stutgart (1974) and Paris (1976). Jerome Robbins choreographed it in the American Ballet Theatre version of 1965. ↑ As told in detail by dancer David Drew, who was in the company at the time. The source is the Royal Ballet's DVD Stravinsky: The Firebird & Les Noces, Opus Arte 2002. ↑ Diaghilev did not permit filming of ballets danced by his company, and much of their original choreography has been lost.